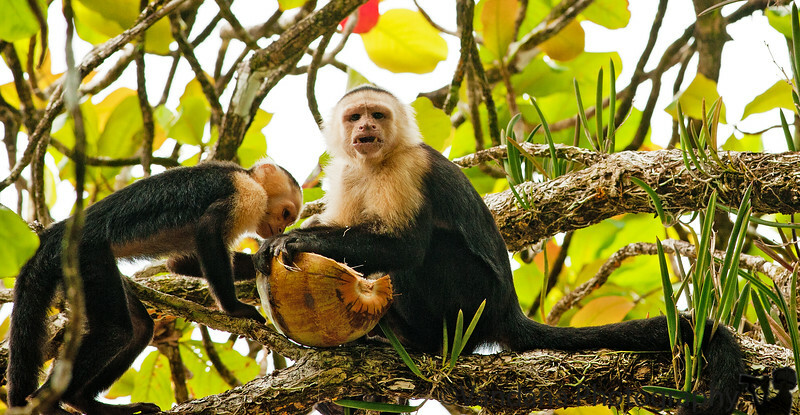 December 20, 2010 - White-faced capuchin monkeys having lunch at Corcovado National Park. @7:30 am, we were picked up by a Spanish speaking driver & driven over potholed roads, to be dropped off at Bahia Adventures. This Bahia outfit is one among 20 companies that have sprung up in this region in the past 2-3 years. They ferry passengers across the Pacific to Corcovado National Park, one of the most unspolit & least visited parks in Costa Rica, on account of its inaccessibility. The only way in is 2 hours on a boat, or on an ultralight aircraft. So this Bahia company was essentially 1 boat, 1 boatman in his 20s & 1 guide in his late teens. The boat was an underpowered 6feet by 20feet structure clearly meant for a lake, or maybe a calm river. Certainly it had no business doing anything on the Pacific. Of course we didn't know any of this going in. We were excited that we were going to go across the Pacific, and happily jumped in. The boat left the shores of Marina Balena & we were on our way. Our guide warned us that we were going in high tide, and it soon became amply clear. The rough waves of the Pacific only got rougher, and our little boat was tossed and turned with every wave. It behaved like a paper boat in the ocean - one giant wave could simply swallow it. We felt very unsafe & uneasy. The captain & the guide tried to reassure us, but they were essentially little kids trying to man a dinky boat, and they knew it. Soon it started raining. The boat would literally lift a couple of feet into the air and then crash back with a thud. This action repeated with every oncoming wave, and we held on for dear life. Both of us realized this was a horribly bad idea, to take a little boat out in the middle of the Pacific. We gave up any hope of survival. V said she felt sorry she hadn't had a chance to speak with her mom last week, now that she was going away. I was too busy concocting last minute plans of survival. Perhaps if I could hold out for 2-3 hours in the cold Pacific in my life jacket, some boat would spot me floating out there & rescue us. Finally the two hours passed, & we could see the shores of Corcovado. But the rains had now become a downpour, and our guide said there was no point going in. It was supposed to be a bird watching tour & we'd see no birds in this much rain. So we consented to turn the boat around and head to a different tip of Corcovado, a non-raining tip. Ten minutes later, we arrived on the shores of Corcovado. We got our supplies on land, & took off on a sort of nature hike in the woods. Spotted a variety of tiny crabs, a few macaws, and an army of Pelicans. But the highlight of the tour was a resident population of white-faced monkeys that plucked coconuts and feasted on them. They were a delight to watch & photograph. Around 2pm, we had a delicious Tico lunch of pineapple, watermelon, gallo pinto & chips. A bevy of local beauties in their bikinis joined us for the ride back home. With 8 of us in this tiny boat, amazingly the boat became a lot more stable. Or maybe it was the tide. Whatever the reason, for the next hour, we were witness to a bunch of humpback whales at delightfully close range, maybe a 100 feet at most. We thought all our troubles were over, and maybe the trip wasn't so miserable after all. Soon, we took a detour and dropped off the ladies at a nearby island. Now the story takes a turn for the worse. As the boat started back towards Marina Ballena, the incidents of the morning repeated themselves, only with a lot more vigor. The boat became quite unstable, the waves very rough, and the rain a torrential downpour. There was absolutely no escape from the relentless water all around. We were completely drenched from head to toe, and everybody including the captain & guide acknowledged that things were quite dicey, though they did go on the defensive saying the weather was usually pretty good this time of year. The problem wasn't really with the weather or the water as much as it was with the boat. This boat wasn't meant for the ocean. It was a very tiny underpowered thing and it couldn't take on the abuse the Pacific & the rains were dealing it. The thuds & the whining motor got louder &more pronounced. This time, we knew our goose was cooked. The chances of survival were in the single digits. The boat would sway from side to side and the giant waves would toss it quite high & we would crash with a thud. On top of it the pouring rain landed on our faces like prickly needles. It was cold and wet and the visibility was quite poor, adding to the fear factor. I do not know how we ever survived. We gave up, closed our eyes & prayed for this water torture to be over. When we finally docked, both me & V realized we had a new lease on life. The water level was quite high on the shores of the Marina, and there was not a soul in sight. We jumped out of the boat into the water, and bravely trooped into the village in the pouring rain. Finally we reached a ranger station manned by a single Policia with a half-naked American & his two bikini-clad daughters. Consider this - a bunch of illegal Nicaraguans had taken them boating, & when they came back, they found no trace of them. Their rental car, their purse & passports, their luggage, their money, all of it was gone!!! All they had was the bikini & the man his speedo! And they stood helpless in the ranger station in the downpour. We realized we may have gone through hell, but here was somebody in an infinitely worse situation. The policeman promised them help, but we doubt if they got any. In this remote part of the world, you are mostly on your own. Our guide got us a taxi & we were dropped off at the Cristal Ballena, where we resorted to 4 capsules of ibuprofen. We had weird nightmares of rolling waves & it will take a while for us to erase the memories of today. On the upside, we took a leak on Mel Gibson's property cause there were no restrooms on Corcovado !!! Yes, Mr. Gibson owns a large beachfront portion of Corcovado & flies in every year on a copter, we were told. Harrowing experience to say the least. I'm glad you made it out of the ocean alive! I love the image, but that's an incredible story! Glad to hear you got out of it in one piece. WOW - great shot and a wonderful story. Thanks for sharing!!!!!!!!!!!! Wonderful shot of the monkeys. An amazing story and adventure! So glad it turned out all right. Oh my, what a story! Glad you're okay!